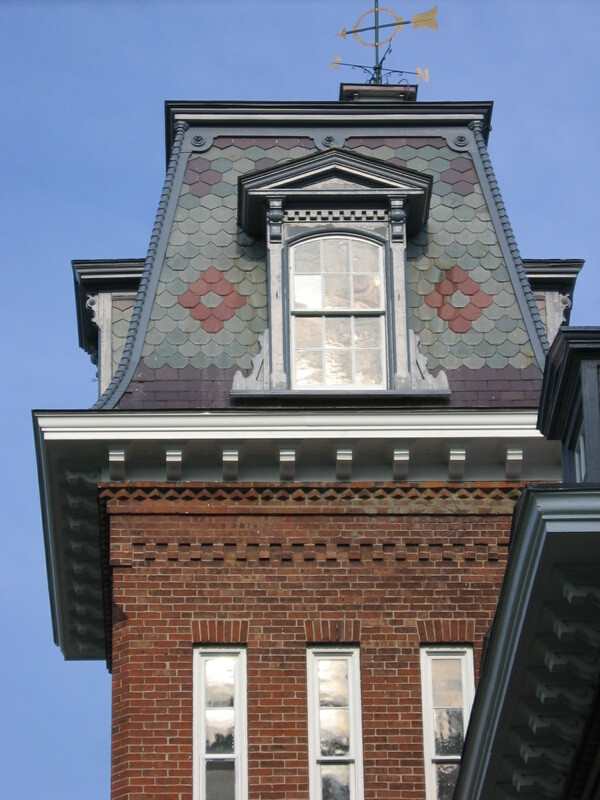 A tower at the Mansion House. The building is still occupied today by some descendants of the Perfectionist community. It also offers overnight accommodations and a historical museum. For many years I collected documentation and objects related to the Oneida Community line of silverplate and in 2004 self-published a book, The Community Table, with the results of my research. Subsequently, I was pleased to be able to donate most of the objects I had collected to the Oneida Community Mansion House Museum in Oneida, New York. (For more about this, click on How I Set the Community Table.) Tony Wonderley, the Curator of the Museum collection, has used many of my items in his 2012 exhibit of Oneida advertising and the objects related to the art deco patterns Deauville and Noblesse and the modernist pattern Lady Hamilton. Names are interesting. The Noblesse and Deauville names have French and aristocratic associations, suggesting the distinctive nature of art deco design. 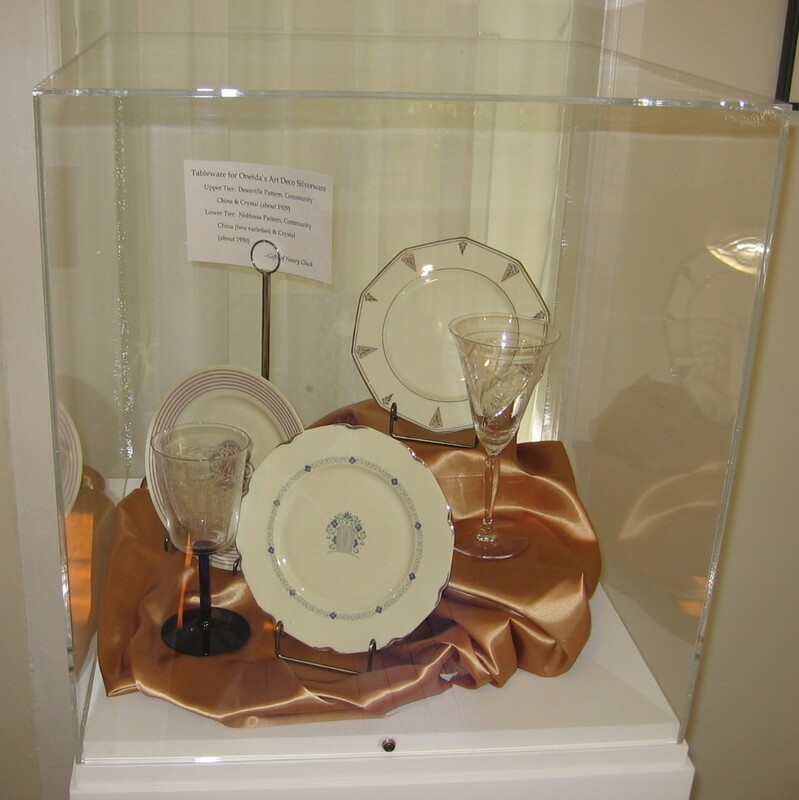 This display shows china and crystal items with the Noblesse and Deauville design motifs. Both Tony and I had assumed that the pattern name Lady Hamilton referred to the infamous Lady Emma Hamilton who had an affair with Admiral Nelson and was the subject of the 1941 movie That Hamilton Woman, starring Lawrence Olivier as Lord Nelson and Vivian Leigh as Emma. Well, we commoners may have thought that, but a visitor to the exhibit pointed out to Tony that the wife of Grosvenor Allen, one of the designers of the pattern, was Christine Hamilton, so the pattern name is probably a tribute to her. Excerpts from Oneida advertisements reflect the spirit of these patterns from the 1930s. 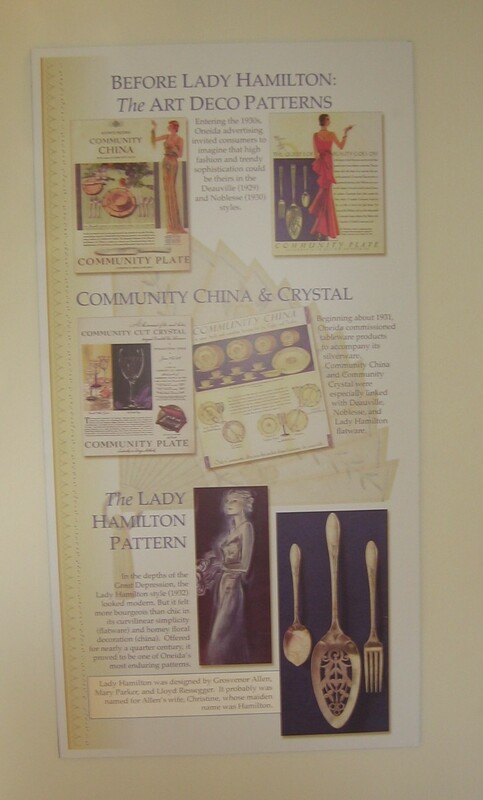 Oneida offered china and crystal in the Lady Hamilton pattern. This display shows how it looks in an integrated setting. 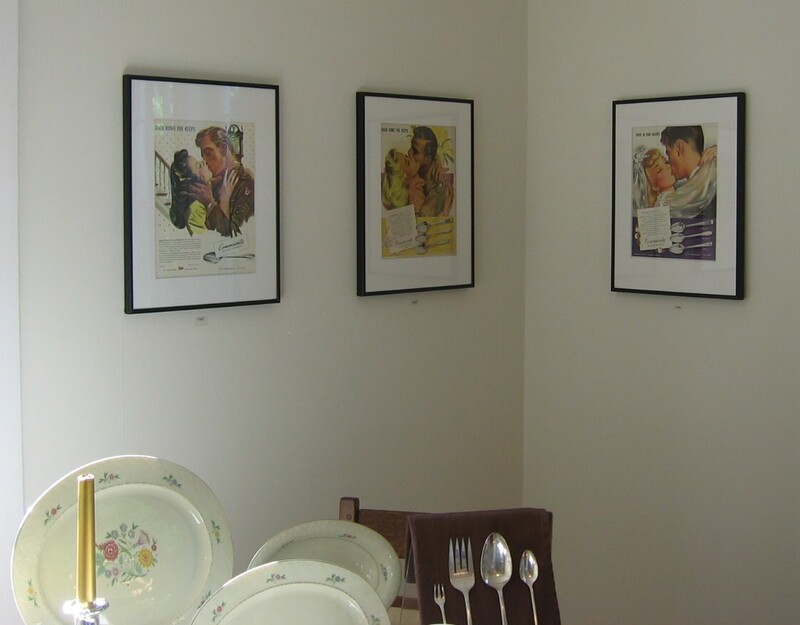 All around the walls, in chronological order, the exhibit displayed the advertising from those years. Even during the Depression years and in the wartime years when Oneida had no silver to sell, the advertising was colorful and represented the work of the best illustrators of the time. If you have Oneida documentation or objects you would like to donate to the Museum collection, get in touch with Tony Wonderly: awonderley at oneidacommunity dot org (no spam please) or via this blog. It is very satisfying to share your joy in these objects which so clearly reflect the history of a fascinating people and time. I have a set of almost 250 pieces of Lady Hamilton silverplate. Through my research, the only piece I am missing is the children’s spoon. 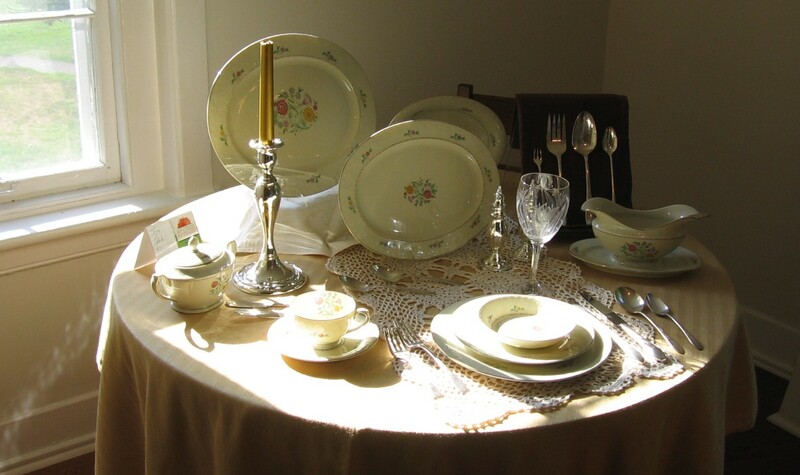 The flatware were is beautiful and I would love to know where I could get a list of the pieces to see if I am missing anything. If that does not work, at my Silver Threads blog, click on the American Silver Booklets tab and work from the list of booklets. I have inherited a complete set of Lafy Hamilton silverware, still in use! I am very proud in owing it! I could send you a picture if you like. I’m writing to thank you for sharing your passion and knowledge of the beautiful—and often overlooked—Lady Hamilton pattern. While not as traditionally valuable or as “brag-worthy” as sterling, it was my late grandmother’s wedding silver, and as such has become a treasured family heirloom. Thank you. As you can see, the Museum at the Mansion House is preserving artifacts connected to the pattern. If you click on my American Silver Booklets tab, I do have a booklet about Lady Hamilton which you can download. Collecting is such a fun hobby. How fortunate the museum was to get your pieces and how cool that you donated them. That table setting is really beautiful. I never could cook and I never had the best china (although now I have my mother’s silver), but I always made a point of setting a nice table.